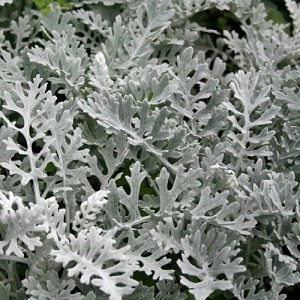 Dusty Miller is a really good foliage plant. This variety has finely cut silvery leaves that look particularly good in the front of borders, along paths and in containers. Grown mostly for their lovely leaves, plants have insignificant yellow flowers in summer. They grow to a height of about 30cm and the same across and have a good compact shape. The leaves look good in flower arrangements. Senecio grows best in full sun to part shade and well-drained soil. The plants are drought, wind and salt tolerant once established and also good for dry or gravel gardens. In warmer parts of the UK and in Mediterranean gardens these plants grow as perennials and maintain a good shape with spring pruning. Pack of approx 500 small seeds. Sow in late winter and spring for planting out in late spring, or sow in summer/autumn for over-wintering in a greenhouse. Sowing instructions and a colour photo are printed on the packet. Sow Sow in late winter/spring if growing as an annual or into summer/autumn if growing in a greenhouse over winter. Sow the seeds on the surface of a tray of moist seed compost and press the seeds gently into the compost. Do not cover the seeds, as light is needed for germination. Keep at 15-25°C and germination takes 2-3 weeks. Transplant seedlings to pots when they are big enough to handle and then out into the garden after hardening off. Grow This plant is normally grown for its leaves, so it is best to remove leggy stems during the growing season as this keeps the plants compact and prevents flowering. If growing as annuals, discard the plants in the autumn once the frosts approach. If growing as a perennial, trim back the plants by 2/3rds in spring. Softwood cuttings take well in summer.